Former Premier League defender Jamie Carragher is not convinced that Gonzalo Higuain is the answer to Chelsea’s attacking woes. The Argentine forward was brought in on loan from Juventus during the January transfer window, after spending the first six months of the 2018-19 campaign at AC Milan. Chelsea rescued him from his ill-fated tempory spell at the San Siro, during which he only managed to score six goals in 15 Serie A matches amid fitness and injury concerns. After firing blanks in his first two outings for the Blues, Higuain notched his first two goals for the club during a 5-0 win against Huddersfield on Saturday, but Carragher has warned Sarri that his bright start at Stamford Bridge could be a false dawn. Higuain played under Sarri for one season at Napoli, during which he scored 36 goals in 35 matches, but the Sky Sports pundit insists he has never been an ‘elite level’ player. 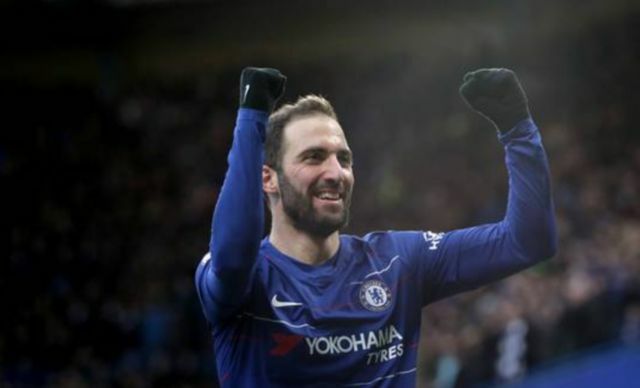 “There’s a lot of talk about Sarri at the moment and I really think he needs this player Higuain to hit the ground running and continue forward,” Carragher said on Monday Night Football, as per Football London. “Look, you’re playing Huddersfield at home it’s far too early to say is he the man to sort of take this Sarri-ball to success this season. What I would say about Higuain over his whole career I’ve always thought he was just below elite level. Real world-class level. “The time he has shown world-class form is under this manager. He’s got I think 38 goals in 37 games at Napoli, he’s just joined Chelsea now, so he has shown world-class form with this manager. Chelsea are currently fourth in the Premier League, with the FA Cup and Europa League still to play for and a Carabao Cup final against Manchester City to look forward over the next few months. The title slipped away over the winter period following an inconsistent spell which highlighted the ineffectiveness of the club’s two main strikers – Alvaro Morata and Olivier Giroud – the former of which was sent out on loan to Atletico Madrid last month. 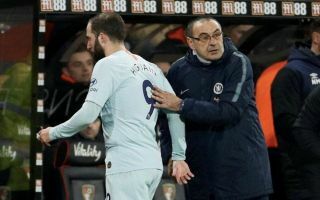 Eden Hazard has been Chelsea’s main source of goals this season, but if Higuain can prove Carragher wrong and share the load with the Belgian between now and May, silverware is still a distinct possibility for Sarri in his first season in English football.